Stop the presses!!!! I have some shocking news! Hope you’re sitting down for this! My Husband ate chicken with tomatoes! Yes, I did it! He actually did! I am still shocked! I didn’t make a big deal or anything about it at dinner, but inside I was laughing and I couldn’t believe my eyes! However, with one of the most flavorful chicken dishes I have ever made, I can see why he chose to have tomatoes with it!! 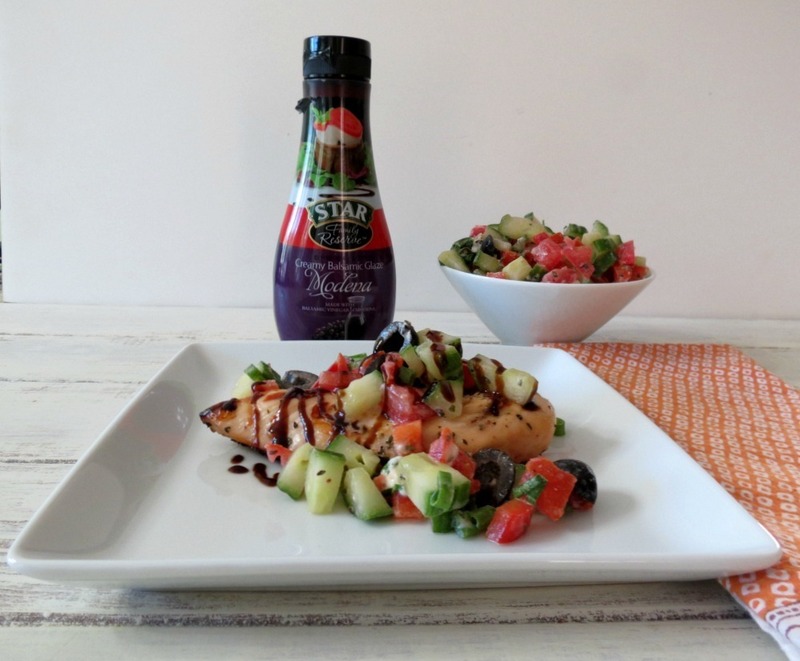 I made Mediterranean Grilled Chicken with the most flavorful Mediterranean salsa ever. I was inspired to make this dish by the huge package I got last week from Star Fine Foods. They asked if I wanted to sample some of their products and I said ok, not realizing they would send me a gigantic box of goodies. If you follow me on Instagram, I took a picture of the package. 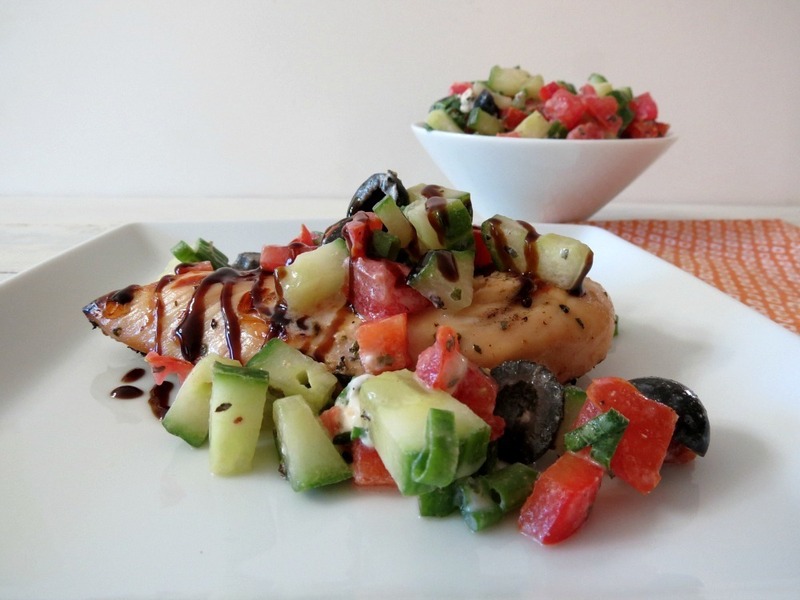 I was shocked and excited to make some great new dishes like this super easy chicken dish! I marinated my chicken in garlic infused red wine vinegar, extra virgin olive oil , oregano and the key ingredient for extra moist and tender chicken, plain greek yogurt. 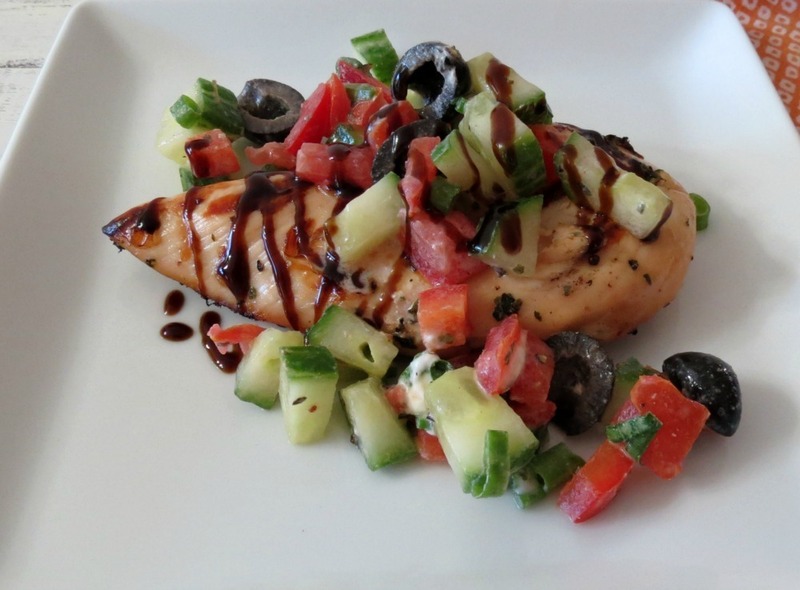 I love marinating my chicken in yogurt, it always turns out wonderful. I don’t know what it is about the yogurt, but on your next chicken dish, marinate it for at least an hour or two with yogurt. It’s crazy moist and it doesn’t curdle when you cook it. For the topping I made a fantastic Mediterranean salsa, that consists of tomatoes, sweet bell pepper, cucumber, black olives, fresh basil, oregano, scallions and goat cheese. When I let the salsa sit in the fridge for a few hours the goat cheese melted and made the salsa creamy. If you don’t like or have goat cheese, feta cheese will work too. That was my original intention, but I was out of feta, plus I heart goat cheese. This dish is very quick to make, I let everything marinate for two or so hours, however, if you make this in the morning and let it sit all day I am sure it will be just as good! Plus if you make extra salsa, you can reserve it to top on crispy french bread or place in a pita. I had some left over, but I ended up eating it, simply plain. Makes for a great snack!! Low calorie and healthy!! For a little added bonus, I drizzled just a little bit of balsamic glaze over the top of the chicken for an added savory punch. My Husband skipped out on the balsamic, since he’s not the biggest fan of balsamic vinegar, but I am, and I love it!! My Husband is all into the olives. He was picking through the salsa trying to get all the black olives. 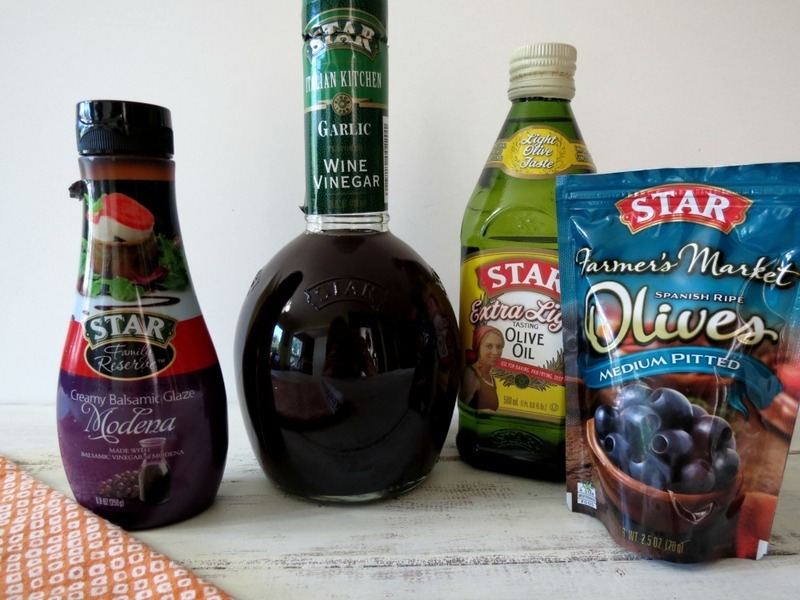 When he saw the olives Star Fine Foods sent me, he asked, like a little kid, can I have some. I said, ok, but don’t eat them all. He said he left me four olives, I don’t know if that is true, I haven’t looked. Silly man!! 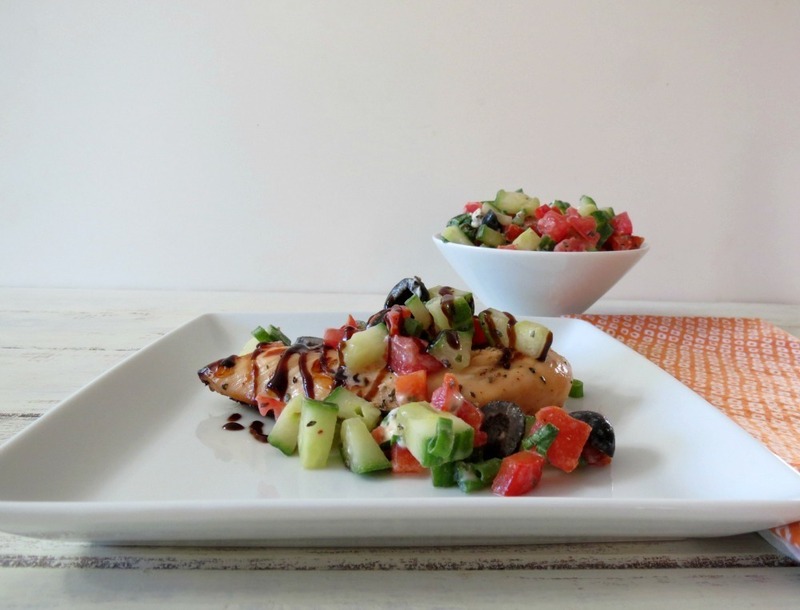 The most tender flavorful grilled chicken topped with a tomato and cucumber salsa. Place chicken in a shallow bowl; set a side. In a bowl, add all of the marinade ingredients, mix until combined. Pour over chicken. Cover chicken and refrigerate for at least two hours. Meanwhile, to make the salsa, add all the salsa ingredients together, and refrigerate until ready to use. Set grill over medium heat. Place chicken on grill and cook for 5 minutes; flip chicken and cook for about 3 minutes or until no longer pink. 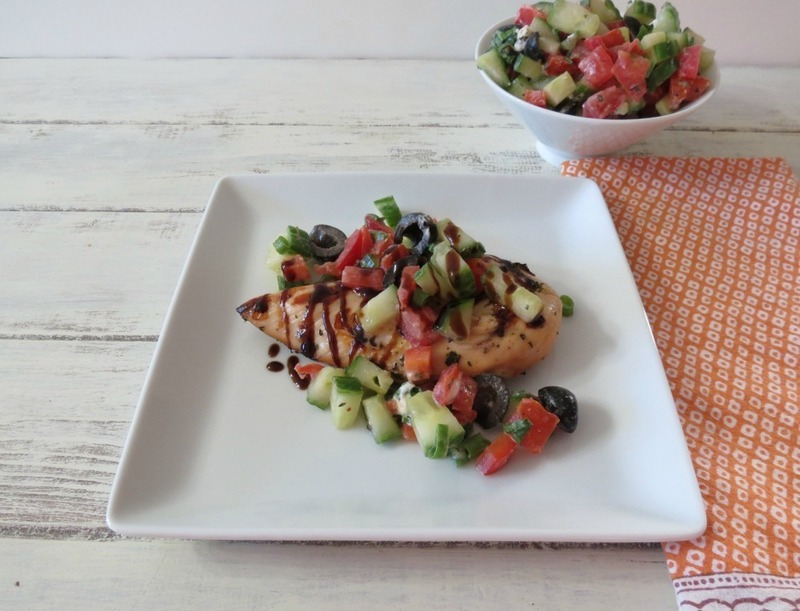 Serve salsa over top of chicken and drizzle with balsamic glaze. If you do not have garlic infused wine vinegar, add about ¼ tsp minced garlic to the marinade. Well that’s it for me, again I don’t have my glasses, so I hope these pictures aren’t to fuzzy or bright. I hate not having my glasses. I think I’ll walk to the store and pick up a pair of those cheap reading glasses. So for the rest of my day, I guess I’ll be cooking because I don’t need to read a computer for that! I’d eat it as well, I like meat with vegetables, so healthy. And olives give an extra taste. I love marinating my chicken in yogurt too. It really does keep it moist. And this salsa sounds so good, of course anything with goat cheese couldn’t possibly be bad. Beautiful! 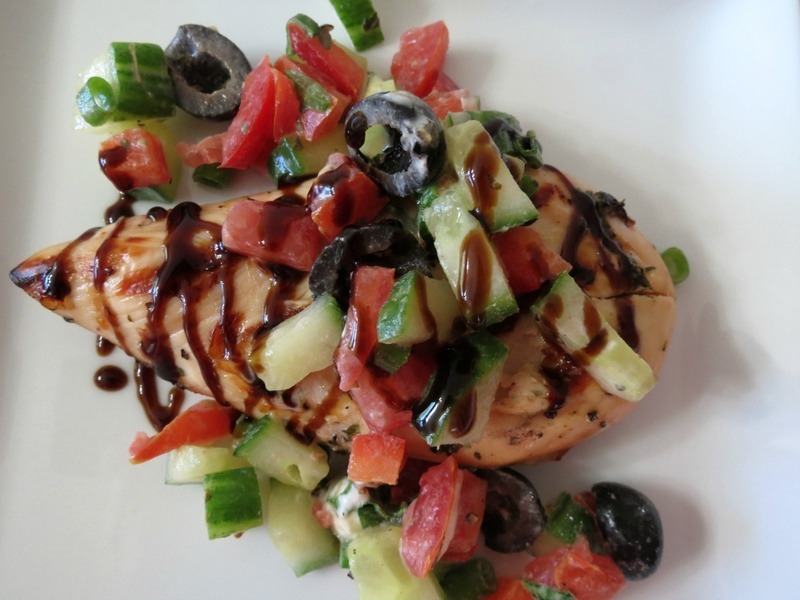 I love the Mediterranean flavors! Simple, fast, delicious!!! What more can anyone ask for! I tend to stick to the same chicken dishes myself, I have chicken for tonight and I’m not sure what to do with it. I wish I could get my husband to eat something like this! This is the perfect summer meal! Just make your salsa on the side, and just serve hubby the chicken. The salsa is great the next day, I topped it on my salad. 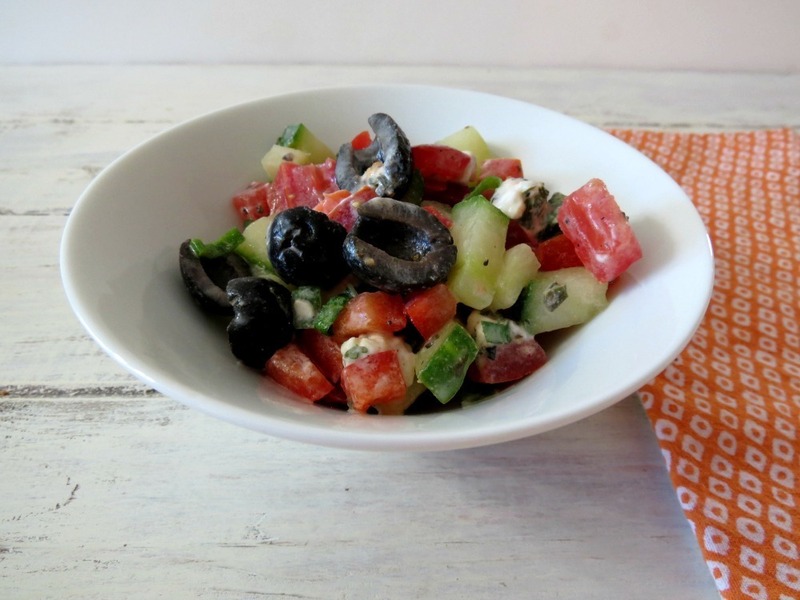 Looks like a great simple salad for either lunch or dinner. Its nice and colorful making it even more appetizing 🙂 Every ingredient used in here is something I could gobble down any day of the week. Thanks Jerry! I agree with you, I do love all the ingredients in this recipe! They are pretty much staples in my house! This is what was for dinner tonight (and will be lunch twice this upcoming week). YUM! No balsamic glaze, so just used regular old balsamic and omitted the basil–didn’t feel like going outside in this heat wave we’re having. I added some diced red onion to the veggies. YUM YUM YUM thanks for a great recipe! Forgot to say I omitted the cheese since I’m not a fan. That’s fine, I go light on cheese myself. This sounds amazing. Definitely going to try it! Thanks Joanna! It’s one of my favorite recipes! Wow, I love all the changes you made to the recipe. I just love this dish! It’s so light and refreshing!! I can’t wait to check out your blog! Could I do this on the stove or in the oven? If so, how long would I need to leave it? Thank you so much for getting back with me. You are always so good about that and it’s very much appreciated.